The Wadden Sea Forum is dealing with climate change and climate adaptation as it concerns our society and the different sectors. Answers on these questions are of high interest for the Wadden Sea Forum (WSF) stakeholders. Due to cooperation agreements, the climate office of the HZG (Helmholtz Zentrum Geesthacht) has adapted their existing climate atlas to the requirements of the WSF sectors. The Wadden Sea Forum is dealing with climate change and climate adaptation as it concerns our society and the different sectors. There was a need for a practical instrument to inform stakeholders in these sectors about climate change. Inform stakeholders in the Wadden Sea Forum about the effects of climate change to the Wadden Sea Region. Due to cooperation agreements, the climate office of the HZG (Helmholtz Zentrum Geesthacht) has adapted their existing climate atlas to the requirements of the WSF sectors. 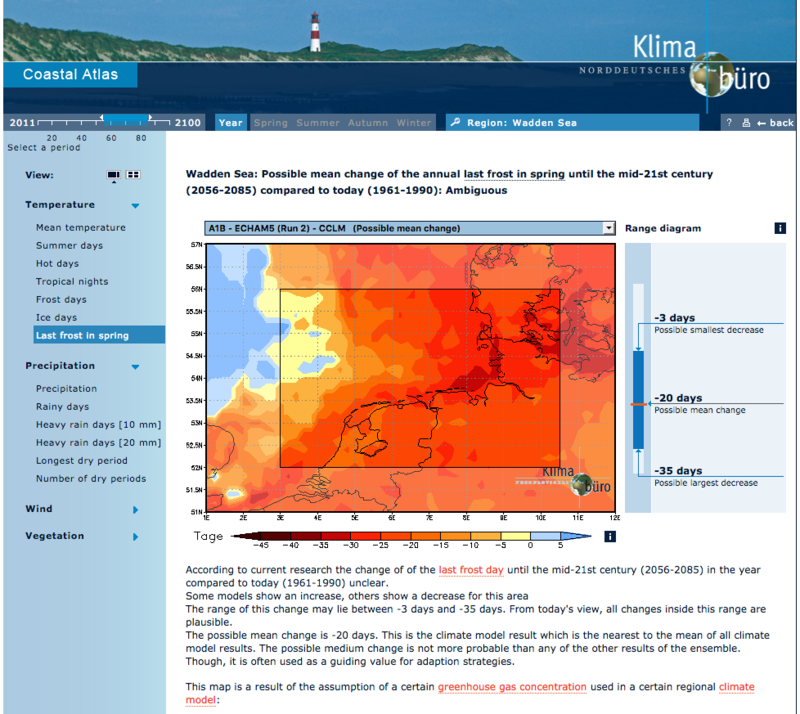 For the Wadden Sea Region, several climate scenarios are placed in this atlas and different parameters can be selected. Further information on water levels, wave heights and water currents will be carried out and integrated in the atlas within the coming months. It is also foreseen, to provide the atlas in the Danish, German and Dutch language. The Wadden Sea Atlas can be found here:. The Altas provides the opportunity to see the consequences of climate change for the future based on scientifical scenarios. There are about 50 different scenarios where stakeholders can see the outcome for the temperature (average, hot days, cold days etc), precipitation (heavy rain, dry periods etc), wind (storm intensity, mean wind speed etc) and vegetation (start of growing season, length of season). The already existing altas has been adapted to include the Wadden Sea as an area. The practice is highly transferrable and the atlas can be extended to other areas in Europe.